When Bryn Mawr Village first opened in 2016, it gave Main Liners something different: a center that had boutique clothing stores, but also a coffeehouse and a place to work out and get a massage. Brokers call this service-heavy retail mix "lifestyling." A trend for many years, "lifestyling" picked up momentum post-recession "to fill vacant space" at malls by offering "the right type of experience for the customer," said Jim Savard, executive vice president of leasing at Metro Commercial. The trend has grown as the mall's traditional role has changed and internet competition has forced malls to be more creative, which means installing restaurants, a grocer, and fitness studio to make the visit worth repeating. La Colombe coffee roasters is a big draw at Bryn Mawr Village – a 52,000-square-foot shopping center on the Main Line. Bryn Mawr Village at 915-925 W. Lancaster Ave. was a developer's demographic dream. It sits close to Bryn Mawr Hospital, Villanova University, Haverford College, and the much larger Suburban Square, and is convenient to some of the region's most affluent residents. Average household income ranges from $119,901 in Ardmore and $138,641 in Bryn Mawr to $144,238​ for Paoli and $151,776 for Wayne. Blank Aschkenasy Properties LLC acquired the building in 2008 from Verizon and spent five years buying and assembling nearby parcels for a total of 2.5 acres to build the village. In his proposal to Lower Merion Township, managing partner Paul Aschkenasy said he wanted to convert the 1920s-era, former SEPTA garage and parking lot into a 52,000-square-foot mix of high-end retail and office development while maintaining the building's vintage feel. The developer broke ground in 2015 on the adaptive reuse — renovating the old building, keeping its brick-heavy exterior and wood-vaulted ceilings — and adding a new structure across the parking lot. It then spent a year carefully selecting tenants and turned away some big name brands. "I'm a big believer in staying away from big commodity products" that can be bought anywhere, Aschkenasy said. "There has to be something different about us. We went after tenants that were a little bit different. Most of our brands are relatively small, local or regional, with a distinctive character to them, such as La Colombe. "We also knew the Main Line in general does not have a lot of big shopping projects," he said. "The truth is, we are 15 minutes from King of Prussia [Mall] and five minutes from Suburban Square. The goal is never to compete with them because they have size, mass and [national tenants]. We are boutique and different, and what we have, you really can't find anywhere else." Metro was brought in to advise Blank Aschkenasy with a leasing and merchandising strategy. One key is that the village's mix "gives the customer multiple reasons to visit the center each week," Savard said. The Bryn Mawr Village as an example of a shopping center undergoing “lifestyling” – putting in tenants that customers most want and need. Clothier Boujee is shown. The center opened slowly in 2016 and now has a 93 percent occupancy rate, the developer said. Lifestyle service tenants including the fitness studio Solidcore and Bryn Mawr Massage. Financial and real estate investment firms were brought in to occupy 17,000 square feet of second-floor office space. Offices comprise about 30 percent of the project. 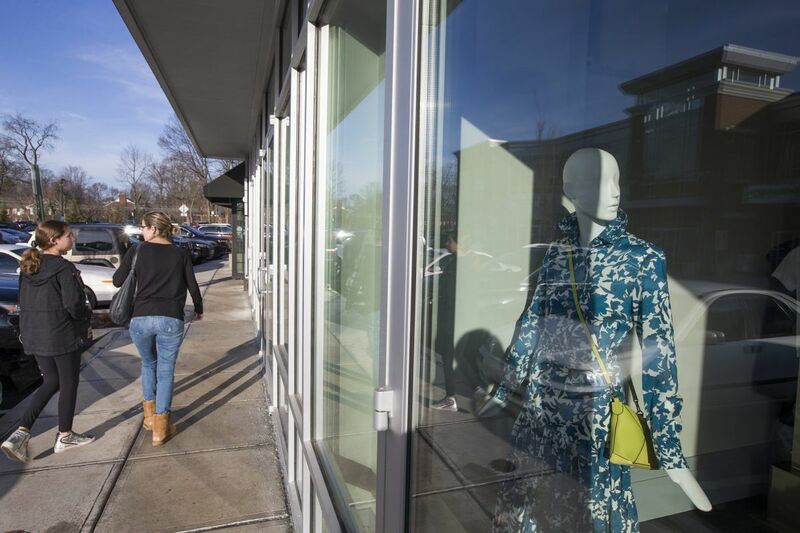 "It's nice to not have to parallel park to shop as you might have to do in traditional downtowns on the Main Line," said Caroline O'Halloran, publisher and founder of Savvy/Main Line, an online newsmagazine, and a frequent visitor to the village "I like the idea of being able to park right outside Athleta and go in and shop, as opposed to having to park far away and schlep through a mall." A shopper walks by Athleta at Bryn Mawr Village last week. The Promenade at Granite Run in Media — formerly Granite Run Mall which shut in summer 2016 — is also using lifestyling under developer BET Investments of Horsham. Upon completion, the project will include a gym, a bowling alley-theater entertainment facility, 10 restaurants, a grocery store, multiple apparel and other retailers, a pediatric office, and 400 apartments. The retail component will debut in the spring. Scott Nash, CEO of Mom's Organic Market grocery store, which has a store nearby in Bryn Mawr, sees lifestyling from a tenant's perspective. A Mom's recently opened as an anchor at the East Market development, a mixed-use project that includes residential, retail and office space in downtown Philadelphia. Among East Market's other committed tenants are Wawa, City Fitness, Iron Hill brewpub and restaurant, and an AT&T Store. "Malls are more experiential now, rather than just a place to go buy something," Nash said. "Landlords look for tenants like movie theaters, restaurants, bowling alleys, massage parlors, large food courts – activity oriented stuff. Grocery, too, although grocery is more difficult to get to work at a traditional suburban mall because parking is hard to control and designate." Bryn Mawr Village was built on an old SEPTA garage. The developer added a new building across the street but maintained the old look. Savard said shoppers should expect more redevelopments to incorporate the lifestyle look and design. "It's really out of necessity because of changing consumer habits," he said. "You have to hit both ends. You have millennials on one end, and the boomers on the other, and they all like to eat and are looking for entertainment."